In a move to expand and develop its regional projects, SM Prime Holdings has issued a third tranche of retail bonds. Bonds are debts that corporations or government units borrow from investors for a defined period of time at a variable or fixed interest rate. SM Prime’s third listing of fixed-rate bonds is worth Php10 billion, due in 2026. PDS Group president and CEO Cesar Crisol said PDS Group has long admired SM Prime’s plans and efforts to expand and develop the country’s up and coming regional cities. 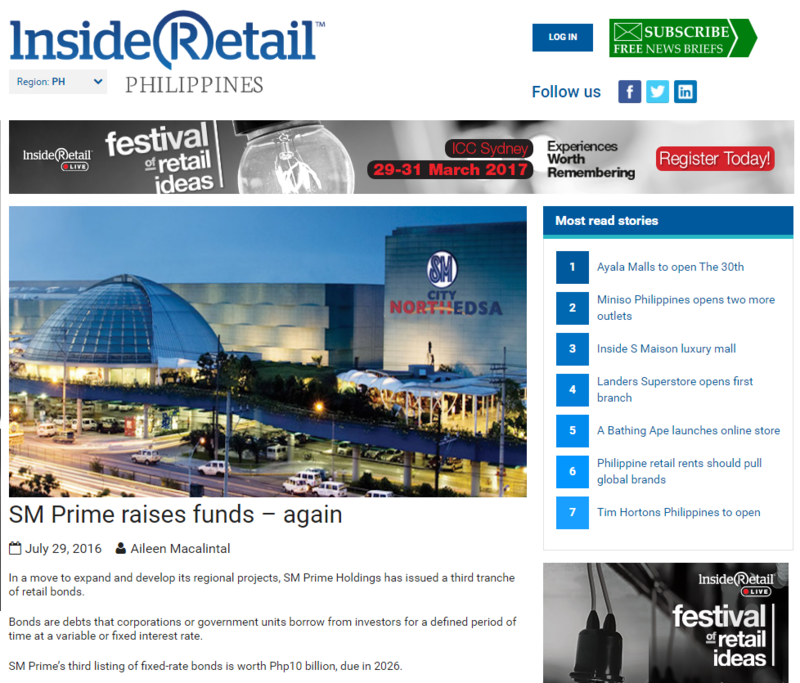 Two analysts told Inside Retail Philippines that the recent issuance indicates SM’s healthy financials, which is good news for SM Prime’s investors. “SM Prime’s almost 15 per cent share in the corporate bonds secondary market is a sign of good business climate in the backdrop and prevailing low interest rates in the market,” said one of them. The other one added, however, that this supports the country’s biggest retailer to eat up more share in the market.